1. In a large bowl, whisk together the mayonnaise, lemon juice and lemon peel; season with salt and pepper. Add the tuna, breaking it apart slightly with a fork, then the beans, cucumber and onion. Season with salt and pepper. 2. 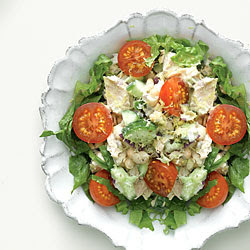 Arrange the romaine on 4 large plates and top with the tuna salad and tomatoes.